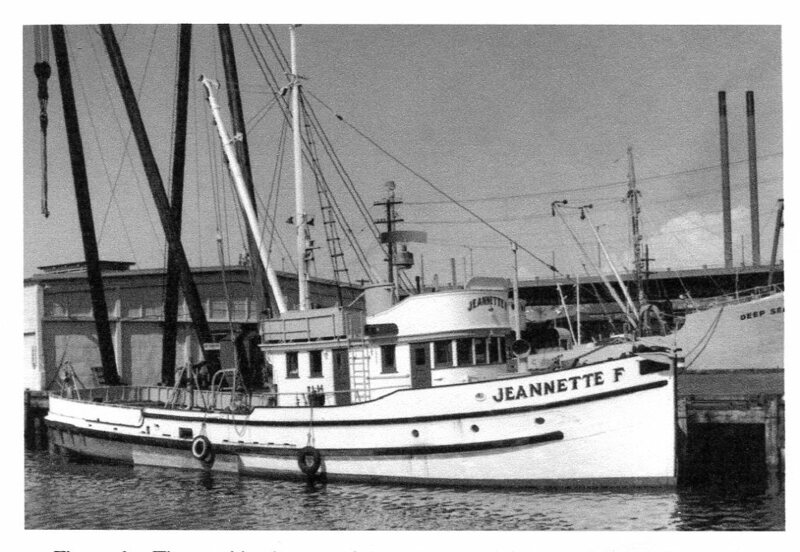 The 410 foot Factory ship Pacific Explorer sailed from Seattle on March 26, 1948 (1) and headed for the Bering Sea to fulfill the objective of the World War II Pacific Fishing project for which she had been modified. 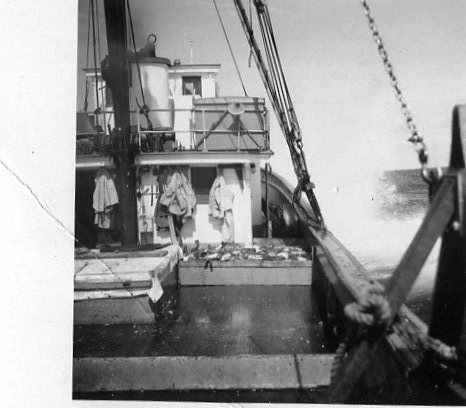 She was to harvest the fisheries resource believed to be in the Bering Sea. This was the catalyst that started the new branch of Fish and Wildlife’s Bureau of Commercial fisheries Exploratory Fishing and Gear Research Base which was initiated in 1948.
a few people who were interested, saying it would be fascinating to interview someone who had been on the Bering Sea trip, but that after 66 years how would we find anyone? Ed Best, a retired biologist who was listening, said “I was there as fisherman on the Kiska that fished for them.” I asked “Were you paid?” because I had heard that the adventure was a financial disaster, and he replied “We were under contract and the pay was good.” Ed retired from the International Pacific Halibut Commission and our paths have crossed over the years, so I asked him if we could get together and talk about his experience. 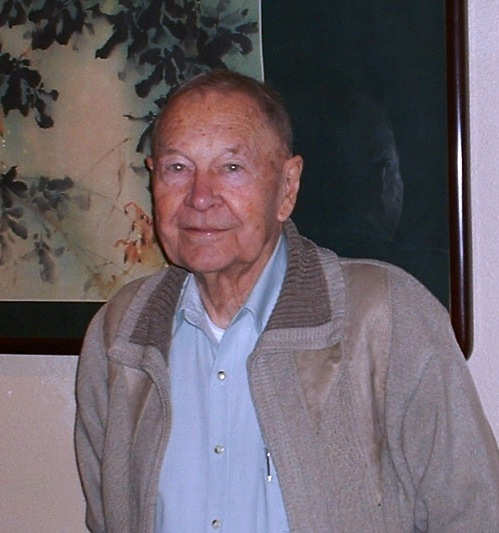 We met later and he told me of his adventures in 1948, when he had just returned from World War II after serving with the 71st Infantry Division in Europe. He was raised in Gig Harbor, Washington, a fishing community where his stepfather owned a salmon seiner and Ed had been part of the crew since he was 13. One evening after his return from the service, as Ed was going into a bar, a bearded fellow coming out asked, “How would you like to go to the Bering Sea this summer and make some money?” Ed said “Yes” and that was the start of the adventure. He went to Astoria, Oregon where the Kiska was located and worked as part of the crew getting her ready for the trip. There were six in the crew – the skipper, engineer, cook and three fishermen. The vessel was owned and operated by the Columbia River Packers Association, with which Nick Bez was affiliated. Pacific Explorer had recently landed tuna from her first trip to South America and Kiska had returned from South America after she was chartered to fish for Pacific Explorer as a bait boat. She was the only one chartered for both of the Pacific Explorer trips. removed from the stern and trawling stanchions were added, along with trawl winches installed midships next to the rail. They were electric, and Ed said that the winches would short out and it was wise to have your rubber boots and gloves on or you got shocked. The Pacific Explorer chartered nine fishing vessels to accompany it to the Bering Sea, the Bear, Sunbeam, Borris, Tordenskjold, Kiska, Mars, Foremost, Jeanette F and Pearl Harbor. All were Pacific fishing vessels and their registered lengths ranged from 56 to 80 feet. Two were purse seiners, two were schooners with the house aft and the remaining five were combination vessels. With the exception of three rigged to use tangle nets, the others were rigged as trawlers. 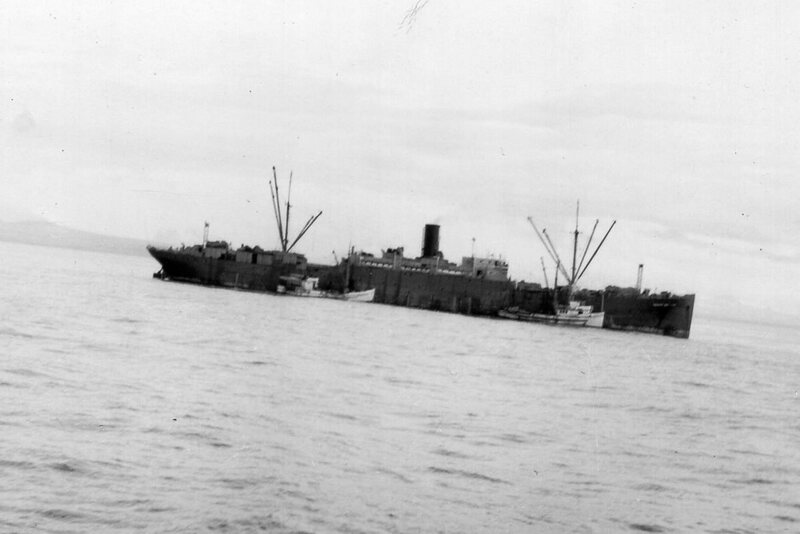 A tenth vessel, which was not under contract but delivered to the Pacific Explorer for a short time, was the Dorothy. She was a schooner whose registered length was 93 feet. 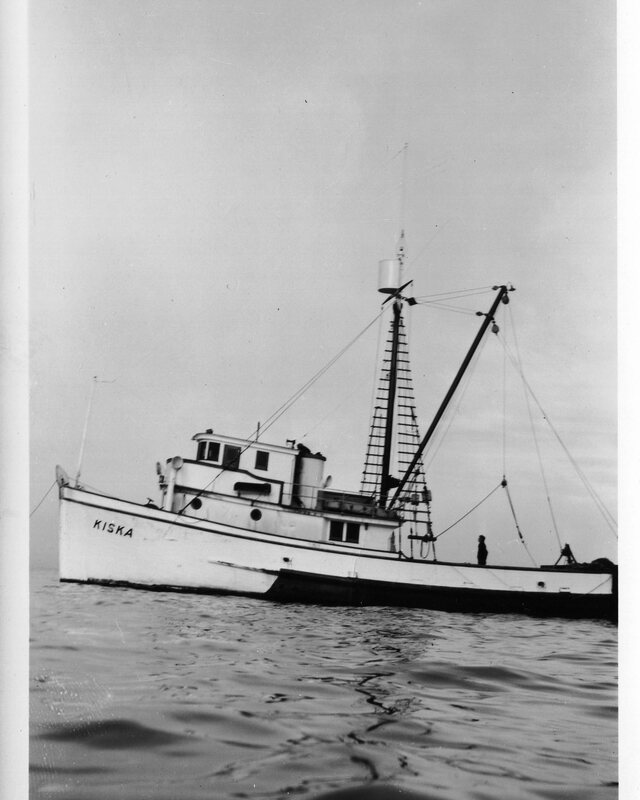 In fact, she was one of the vessels that was chartered in the original exploration work before the war in 1940 and 1941, which started the Pacific Fisheries Project. trip. She had to hire a processing crew for the factory, such as a filleting line for flatfish as well as the cannery personnel for processing King crab. Once completed the vessel departed Seattle and went directly across the northeastern Pacific via Juan de Fuca Straits, where they planned to rendezvous with the chartered fishing fleet in the Bering Sea. Kiska and the Mars traveled together via the inside passage as did the other charters. 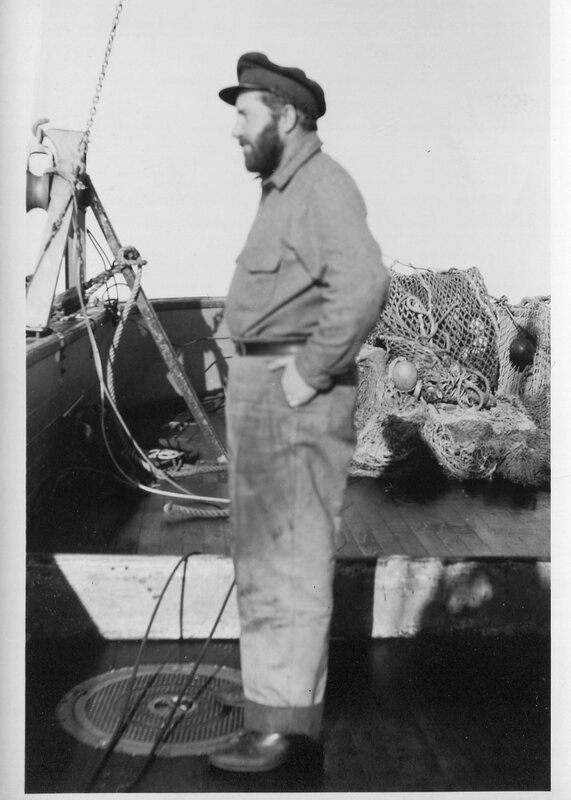 Ed had been through the inside passage before when he seined for salmon in Southeastern Alaska as well as trawling off the Washington and Oregon coast, but had never crossed the open water in the Gulf of Alaska or been in the Bering Sea. He was one of those fortunate persons who were not affected by seasickness, even when they had to hove to in a blow off Kodiak. The Pacific Explorer apparently experienced the same blow and had to slow down, because of the danger of breaking one of the numerous ammonia lines that could endanger the crew. 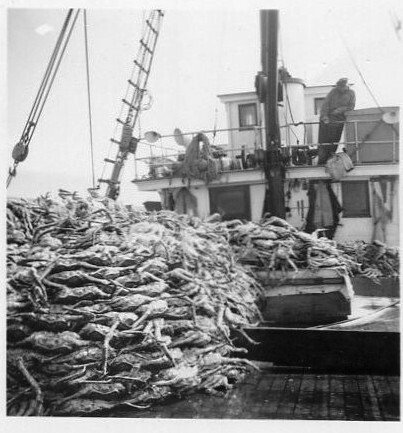 This entry was posted in boat building, Exploratory Fishing Base, Maritime History, Nick Bez, Ocean fishing, Pacific Explorer, Pacific Fishing History Project, R/V John N. Cobb, Resources About Fishing and tagged Bering Sea, groundfish, king crab, Pacific Fishery History Project, trawling. Bookmark the permalink.